I had lunch a while back with a Christian guy, who insisted there is an “abstract” realm, God, etc. He had a convoluted “proof” of God’s existence (and the existence of this whole Abstract Realm) based on … the existence of language and information. He basically argued that there are certain problems that cannot be solved without assuming his ontology: the fact that there is life in the natural world … means that there is information … means that there is “language”…. implying that there is more than just natural-world causality… implying that there are these other realms and ontological breakdowns. In other words, if you have “meaning” you have to have some intelligent being that imparts the meaning; and language has meaning, by definition, right? And there is a “language” to life itself, right? Right? So… the natural world has “meaning” and “thus” there must have been a God who “authored” this meaning or language. Hey, the universe sings to me, man, so it must be alive–singers are alive, aren’t they? And here we see the perils of overuse of metaphors and non-rigorous reasoning combined with wishful thinking and creative imagination (see Appendix: On the dangers of metaphors in scientific discourse to my post Objectivist Law Prof Mossoff on Copyright; or, the Misuse of Labor, Value, and Creation MetaphorsRead more: Objectivist Law Prof Mossoff on Copyright; or, the Misuse of Labor, Value, and Creation Metaphors). Anyway, I tried to clarify his picture of reality, to pin him down, to get him to see how ridiculous this is. He refused to include “God” as part of “the universe” even though it’s “all that exists,” so I had to create new terms. 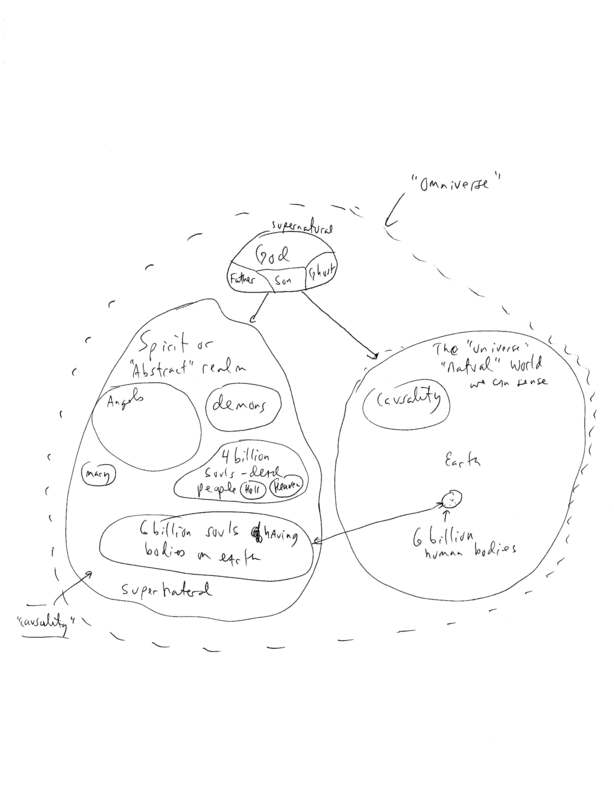 I made this drawing of “The Ontology of the Omniverse,” and provided him with a description, an edited version of which is below. He tentatively agreed with my description, but didn’t seem interested in discussing it further. Dear __: I sketched out my understanding of your view of things. We have the “Universe” or Natural Realm, but there are other things outside this. So, since you have no word for “all that exists,” and refuse to grant the word “universe” for this purpose, I use “Omniverse” to describe “all that exists” (a bit reminiscent of Marvel Comics’ idea of the “multiverse“). Inside the Omniverse there is the Natural Realm (Universe), God, and some spirit or “Abstract Realm” (as you call it). God “permeates” all of the Omniverse and controls it, and He Himself has three persons or aspects: Father, Son, Holy Spirit. The Natural Realm contains the natural world we know, governed by causality (Natural Universe type causality, mostly, although it can somehow interact with the Abstract Realm and with God). It contains the planet Earth, and about 6 billion human bodies. As C.S. Lewis said, “You don’t have a soul. You are a Soul. You have a body.” So there are a bunch of “human beings”–their Souls are in the Abstract Realm, and the ones that still have bodies have bodies in the Natural Realm (on Earth). The Abstract Realm has its own causal laws, which we know nothing about, but it has to have some, because God controls them and beings in that realm are not omnipotent; yet the humans in that realm have some causal influence over what happens in the Natural Realm too. So the Abstract Realm contains one human soul or spirit or “mind,” for each human body in the Natural Realm (though if we create a clone of a human, here on Earth, maybe it would be a mere-body with no corresponding Soul), and there is some functional connection between each such Soul and “its” body. Presumably the Abstract Realm contains the souls for now-dead human bodies, say, 4 billion or so of those [note: this was my estimate; looks like it may be closer to 100 billion humans have lived and died]. Some of these are presumably in Heaven, a sub-realm of the Abstract Realm (“Heaven” means the Souls have a connection to God or in his presence; others are in “Hell”–away from God’s presence). The Abstract Realm may also contain other beings, such as Angels and Demons, some of which can somehow interfere causally with the universe (in particular, Earth)—which is one reason there has to be causality in the Abstract Realm (indeed, an overarching Omniversal causality, to enable the Abstract and Natural Realms to interact), because otherwise a single Demon could just destroy or conquer all of the Natural Realm (Universe); but they don’t, so obviously there are limits on their powers—i.e., some causal rules. We may refer to the Abstract Realm (plus God) as “supernatural,” because they are “outside” the Natural Realm, but from the point of view of the Omniverse, there are some laws that obviously apply throughout, which may be called omni-natural laws. Being a fan of imaginative fantasy and science fiction, I can conceive of such an ontology, and even find it interesting … and if there were evidence for it, I suppose one would have to accept it. But as far as I could tell your theory is that there are certain problems that cannot be solved without assuming such an ontology: the fact that there is life in the natural world … means that there is information … means that there is “language”…. implying that there is more than just natural-world causality… implying that there are these other realms and ontological breakdowns. I don’t see how this is implied by the purported problem, or how it solves this problem, or that there is any evidence or indeed reason to believe in the existence of anything other than the Natural Universe itself–i.e., the Natural Universe is the Omniverse. But maybe we can chat on this next time we get together. On maters of spirtuality I find it best to let the word of God do the speaking. 13Which things also we speak, not in the words which man’s wisdom teacheth, but which the Holy Ghost teacheth; comparing spiritual things with spiritual. This fellow seems to be arguing for a Platonist justification of Christianity. He makes a number of strange assertions, but there are actually very good arguments–many of them secular–for modern Platonist metaphysics. Roughly summarized, the idea is that there is an abstract realm of properties, populated by concepts such as ‘the number two’ and perhaps ‘being Stephan Kinsella.’ (It is certainly possible that this abstract realm could be populated with intensional beings, such as God or demons, though this need not be the case by necessity. The idea is that every physical object stands in relation at least one abstract property. For example, both 2 and II are physical symbols (in this case appearing on my screen) that instantiate the property of ‘being two,’ an entirely distinct, abstract property which maintains an existence apart from the physical instantiates. It’s important to note that the instantiation relationship between the abstract property and physical object is not causal; it’s not even a relationship. That is, the abstract property of ‘redness’ is causally disconnected from the process of dyeing something red. This avoids the weakness of older versions of Platonic metaphysics which failed to account for the causal interaction between the Great Divided Line. This view is attractive because of how well it deals with classic metaphysical problems, including the problem of too many sevens, etc. Additionally, this theory squares up nicely with Moderate Rationalist epistemology. A good introduction to this view can be found in Michael Jubien’s Contemporary Metaphysics. I would also suggest a recent anthology called The Waning of Materialism. This book has some compelling arguments for non-materialist, and yet secular and non-supernatural, metaphysics. Moreover, these views are very compatible with the Rationalist foundation of Austrian economics. Both you and the late Murray Rothbard see and think more clearly about these things than most Christians. You’re definitely helping me organize my thinking on the issue. I’m particularly interested in what you call omni-natural laws–if there were a God, even he would have to abide by the laws of logic (he couldn’t be both God and not-God simultaneously); better still if the God embodies these omni-natural, or a priori laws. Heck, your description of the two realms actually makes the idea of Christ’s incarnation more clear. Be careful: this kind of critical thinking and derision of Christianity may lead to conversion.